^ As wartime provisional capital during the Second Sino-Japanese War. ^ The last monarch of the Qing dynasty, Xuantong Emperor abdicated, Qing dynasty formally ended. ^ Marco Polo Bridge Incident started. ^ Surrender of Japan at the end of World War II. ^ Dreyer, June Teufel (17 July 2003). The Evolution of a Taiwanese National Identity. Woodrow Wilson International Center for Scholars. Retrieved 13 January 2018. ^ a b China, Fiver thousand years of History and Civilization. City University Of Hong Kong Press. 2007. p. 116. ISBN 9789629371401. Retrieved 9 September 2014. ^ Roy, Denny (2004). Taiwan: A Political History. Ithaca, New York: Cornell University Press. pp. 55, 56. ISBN 0-8014-8805-2. ^ "Introduction to Sovereignty: A Case Study of Taiwan". Stanford Program on International and Cross-Cultural Education. 2004. Retrieved 25 February 2010. ^ a b "The Chinese Revolution of 1911". US Department of State. Retrieved 27 October 2016. ^ Spence, Jonathan D.  (1991), The Search for Modern China, WW Norton & Co. ISBN 0-393-30780-8. ^ Meyer, Kathryn; James H Wittebols; Terry Parssinen (2002). Webs of Smoke. Rowman & Littlefield. pp. 54–56. ISBN 0-7425-2003-X. ^ Pak, Edwin; Wah Leung (2005). Essentials of Modern Chinese History. Research & Education Assoc. pp. 59–61. ISBN 978-0-87891-458-6. ^ Guillermaz, Jacques (1972). 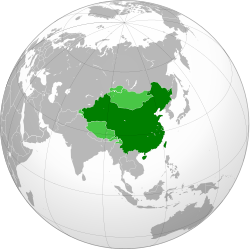 A History of the Chinese Communist Party 1921–1949. Taylor & Francis. pp. 22–23. ^ "民國十六年，國民政府宣言定為首都，今以臺北市為我國中央政府所在地。". Ministry of Education, ROC. Retrieved 22 December 2012. ^ Edmund S. K. Fung. In Search of Chinese Democracy: Civil Opposition in Nationalist China, 1929–1949 (Cambridge; New York: Cambridge University Press, 2000. ISBN 0521771242), p. 30. ^ Chen, Lifu; Ramon Hawley Myers (1994). Hsu-hsin Chang, Ramon Hawley Myers (ed.). The storm clouds clear over China: the memoir of Chʻen Li-fu, 1900–1993. Hoover Press. p. 102. ISBN 0-8179-9272-3. After the 1930 mutiny ended, Chiang accepted the suggestion of Wang Ching-wei, Yen Hsi-shan, and Feng Yü-hsiang that a provisional constitution for the political tutelage period be drafted. ^ Jing Zhiren (荆知仁). 中华民国立宪史 (in Chinese). 联经出版公司. ^ Brendan M. Howe (2016). Post-Conflict Development in East Asia. Routledge. p. 71. ISBN 9781317077404. ^ Gary Marvin Davison. A short history of Taiwan: the case for independence. Praeger Publishers. p. 64. ISBN 0-275-98131-2. Basic literacy came to most of the school-aged populace by the end of the Japanese tenure on Taiwan. School attendance for Taiwanese children rose steadily throughout the Japanese era, from 3.8 percent in 1904 to 13.1 percent in 1917; 25.1 percent in 1920; 41.5 percent in 1935; 57.6 percent in 1940; and 71.3 percent in 1943. ^ Schillinger, Nicolas (2016). The Body and Military Masculinity in Late Qing and Early Republican China: The Art of Governing Soldiers. Lexington Books. p. 2. ISBN 978-1498531689.